Cab drivers have launched a campaign to bring the trade into the 21st century. It’s fair to say that London’s black cab drivers have not taken the rise of ride-hailing app Uber well. The start-up, which has delivered 10s of millions of trips in the capital, has been met with gridlock protests, judicial reviews and furious Twitter rants. Now it seems the taxi trade has given up on trying to hamper its new competitor and plans to fight back by more positive means – by improving its service. Today the trade launched a new 'action plan', backed by the London Taxi Company, which manufactures black cabs, and the Licensed Taxi Drivers Association (LTDA). The campaign calls for taxis to all be equipped with ultra-fast wifi and contactless card readers, and for new zero emissions cabs to take to the streets by 2018. It’s a welcome change of tone from an industry that has been all too easy to portray as opposing technological progress. The campaign is also backed by the ride-hailing apps Gett and Hailo which, unlike Uber, allow customers to order a black cab. Last week Gett announced a plan to acquire Radio Taxis, a deal that would give it 11,500 members, around half of all London’s licensed taxis. There's no reason this campaign shouldn't work. While Uber will always have the edge on price, there's no denying hackney carriages are more comfortable than a Toyota Prius and by offering card payments as standard and working with the app companies they can start to compete on convenience. The campaign is testament to the power of competition - it's hard to imagine the trade having such an active desire to change if it didn't have Uber shaking it to its core. 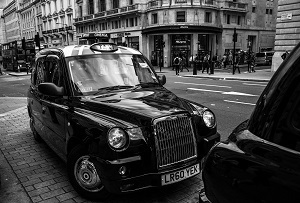 Cabbies will likely have a friend in the form of London's next mayor; both Sadiq Khan and Zac Goldsmith have threatened to cap the number of private hire vehicles, which includes Uber cars, should they come to power - which one of them almost certainly will. ‘London acts as a beacon for cities around the world and the next Mayor has the opportunity to enact an ambitious policy agenda to ensure that our city remains a world leader in technology, service and on the environment,’ said Peter Johansen, CEO of the London Taxi Company. It seems not everyone got the memo, though. Campaign group Action for Cabbies is raising money - more than £200,000 so far – to challenge a new Transport for London plans to force all black cabs to provide a contactless credit card machine (and to cover the cost of each transaction, rather than passing it on to the consumer). Evidence that while most of the trade has seemingly woken up to what consumers want, there are still some who aren’t willing to change their ways.